LIC Policy Status Enquiry is essential for all the policyholders because it helps them to know the next premium due date. Here I have provided different methods of checking the LIC India policy status in the below sections. Hence, read the complete article to know about LIC of India Policy Status Enquiry. In earlier days LIC of India Policy Status checking is a long and time-consuming process. The insured has either visit the nearest LIC Branch Office or to keep in touch with LIC Agent to know the Status of their Insurance policy. In today’s busy life the policyholder does not have sufficient time to line up in a queue to track the policy status. With time LIC India is also modernized, LIC offers a vast range of services to its customer’s convenience. The Life Assured can track the policy status anywhere and anytime. The insured can check the LIC Policy in different ways such as online, through phone, through SMS. Why do we need to know the status of LIC Policy? People often forget to check their LIC Policy Status. The LIC Insurance policy is a shield against eventuality, but it is prime to keep the status of your insurance policy to ensure optimum returns. After all, a lapsed policy is pointless. The Insured can check LIC India Policy Status from any place anytime, which means the insured need not pay a visit to the LIC office and stand in a queue. Furthermore, the policyholder can regularly check the status of policy to stay updated about the interim bonus and other important details. Life Insurance Corporation is the largest assurance company in India, and its policyholders are spread far and wide. The common question arises in every insured is how to check the status for selected LIC Insurance Policy or How to find my LIC Premium Status. LIC offers different services to provide hassle free environment for the policyholder. If insured haven’t checked policy lately, find some time and do it today. Let us have a look at the different methods to track the LIC Premium Payment Status. 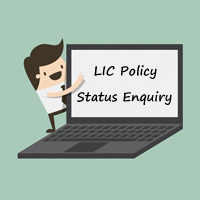 How to Check LIC Policy Status? Visiting nearest LIC Office Branch. Today LIC India has around 30 crores policyholders and 10 lakh LIC agents in India. For today’s modern and tech savvy policyholders, it is simple to ‘Check their LIC policy status Online’. Hence the Online services will prove to be a boon to the insured and LIC agents to know their policy status. To get the LIC online services, the insured has to register into the LIC portal. So, check the LIC Online Registration process here. Visit LIC India Official website www.licindia.in. 2. 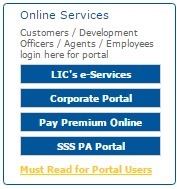 On Online Services tab, click on LIC’s e-Services option as shown in the figure. 3. Click on “New User” option as shown in the below image. 4. A new page will open as shown in the below image. 5. For New Registration as User, you need to provide information as follows. Date of Birth of Life Assured. 6. After successful completion of filling these details click on proceed option, which directs to a new page. 7. In a new page, create a User ID and Password. The username must contain alphanumeric, characters, dot and underscore. Make sure that the password is between 8 to 30 characters long & Password need to have at least one numeric character (Ex: 0-9). 8. After successful completion of this registration process, an auto-generated message will be sent through mail containing policyholder Login details. 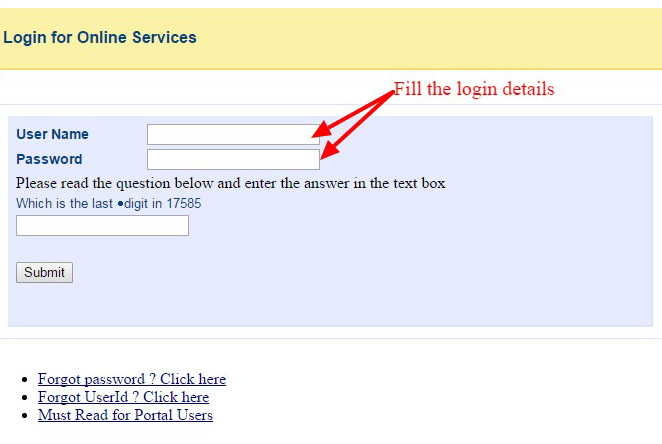 These are the LIC Online Registration process for the new users. After completion of LIC registration process, you will get username and password. The LIC Policy Status Login steps are as follows. By using the New Login Details insured can view LIC policy status and other information regarding LIC Insurance Policy. Now policyholder can log in as a Registered User. Click on “Yes”, an online insurance policy enrolment form will be open as shown in the figure. In “View enrolled policies”, list of options appear on the left side of the screen, select view enrolled policies among them. In a dialogue box, it will ask to enter the text shown in the image, so enter it and then click on the submit button as shown below. After successful completion of code entering, a new page containing Insured’s policy number will be open, Click on “Policy Number”. After entering the Policy number, the policyholder can get all the LIC Policy details such as LIC Online Policy Status, Premium due date, Maturity date, loan amount, and loan interest amount loan, revival, premium due, maturity calendar and policy calendar, etc. Thus you can check your LIC Policy Status by policy number online. 1. First of all, visit the LIC India official website: www.licindia.in. 2. 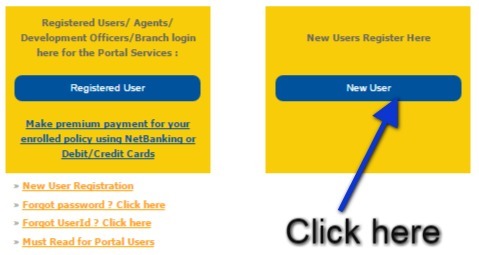 On Online Services tab click on LIC’s e-Services as shown in the figure. 3. 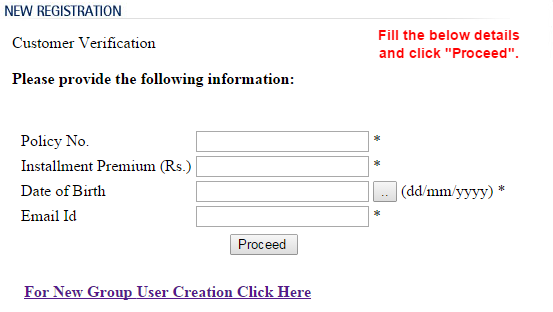 Click on the Registered user option as shown in the below image. 4. LIC Policy Status login specifies policyholder to enter Login Id & password of LIC account. 5. After entering the details, click on “Submit” as shown in the image given below. 6. After successful login, the policyholder will have access to check the policy details. 7. A new fresh page is opened where insured need to click on “View enrolled policies”. 8. A new window opens as shown in the below. 9. This click will take insured to the page where an image with text appears. Enter the same text and click on “Submit”. 10. After successful submission, a new page will be open. 11. 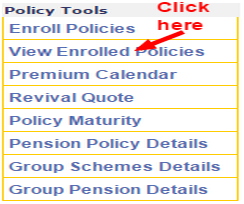 After selecting Policy number, LIC India policy status will be displayed as shown in below. Already Registered Users can also Check LIC Premium due date, LIC Policy Statement along with the LIC Status. LIC Policy Status through SMS? If in case policyholder doesn’t want to check the LIC insurance policy status online or want to avoid the hassle of registration etc. Then he/ she can check their LIC policy status through SMS without registration. The corporation has introduced LIC SMS services for insured. Now the policyholder can get LIC India policy status by SMS that means simply by sending a text message using Mobile phone. This free SMS information system will be helpful to all the LIC policyholders to get policy and servicing details. By this way, you can check your LIC of India policy status without registration and login. The SMS Alert service provided by the LIC India is the easiest and time-saving method to know the lic premium status. In earlier days Policyholders had to visit the nearest LIC Branch to be aware of their policy status but now due to this SMS service, there is no need to visit the LIC Branch office. The Insured can get their LIC policy status and other information via SMS by sending SMS to 56767877. Premium: Installment premium under the policy. Revival: If the policy lapses, Revival amounts payable. Bonus: Amount of bonus Vested. Loan: Amount available as the loan. For Individual policy inquiry through SMS, one should type the following content and send it to 56767877. To know your installment Premium type the following content and send it to 56767877. If selected policy has lapsed, to know your revival amount type the following content and send it to 56767877. To know the amount of bonus vested for your policy type the following content and send it to 56767877. To know the amount of loan insured can avail against your type the following content and send it to 56767877. To know the nomination details for Insured LIC Policy type the following content and send it to 56767877. For LIC Pension Policies, the SMS number remains the same, i.e., 56767877. However, the message codes vary slightly. Hence check the code used to enquire about selected LIC Pension Policy through SMS as shown below. For LIC Pension policy inquiry through SMS, type the following content and send it to 56767877. ANNPD: Last Annuity Released Date. CHQ/ECS/NEFT and PDTHRU: Annuity Payment thru. The Insured might have several questions in their mind like How to Check LIC policy status without registration? how to know LIC Login policy status? How to find LIC Policy Number by Name? For your convenience here we are providing the solutions for those questions by giving the procedure of LIC India policy status through customer care. With this, you can also view lic policy status. LIC India has also provided another easy option to track policy status. That is by calling “LIC customer care.” Hence the individuals who don’t have internet facility can easily track their policy status through the phone. LIC is providing 24*7 customer care assistance facility in most of the cities. All You have to do is dial 1251 if you are MTNL/ BSNL user or type your city code before the IVRS number to use this facility. The insured can use respective helpline number of their city. The zone wise “LIC customer care” number of each city are given below. Let us have a glance at the Customer Care Numbers for different cities in India. These are the different methods for checking the LIC of India Policy Status. So, follow any of these methods as per your convenience for tracking the status of LIC policy. Hope, after going through this, you can check LIC Policy Status easily.